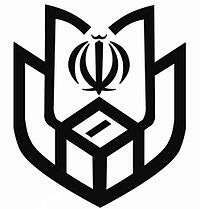 The Election Office (Persian: ستاد انتخابات کشور‎‎) is the body charged for implementation of election procedures in Iran and is subordinate to the Ministry of Interior. 1 2 "Polls close across Iran". Mehr News Agency. 26 February 2016. Retrieved 11 August 2016. ↑ ثمره هاشمی رییس ستاد انتخابات کشور شد. Donya-e-Eqtesad (in Persian). 7 October 2006. Retrieved 17 August 2016. ↑ افشار رئیس ستاد انتخابات کشور شد. Tabnak (in Persian). 24 November 2007. Retrieved 17 August 2016. ↑ کامران دانشجو رئیس ستاد انتخابات کشور شد. Mehr News Agency (in Persian). 16 March 2009. Retrieved 17 August 2016. ↑ سیدصولت مرتضوی ‌رئیس ستاد انتخابات کشور ‌شد. Aftab News Agency (in Persian). 17 May 2011. Retrieved 17 August 2016. ↑ مقیمی رئیس ستاد انتخابات کشور شد. Tasnim News Agency (in Persian). 12 April 2015. Retrieved 17 August 2016.